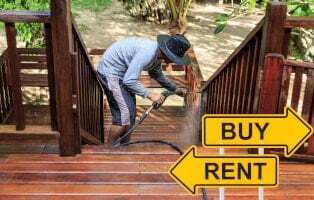 You have three choices when it comes to pressure washing your grimy outdoor surfaces: hire a professional, rent a unit, or buy one. 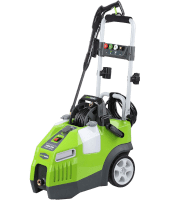 Purchasing your own top-performing electric pressure washer can save you money down the road, especially if you’ll use it more than once or twice a year. 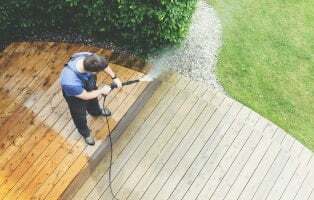 Gas pressure washers are another option, but for most homeowners, a top-rated electric power washer will perform just as well as an average gas model. * Like all pressure washers, they can be dangerous if not used correctly. We’ll talk about safety tips that will prevent surface damage as well as injury to you, your family, pets and plants. Whether you need to clean decks, patios, walkways, cars or farm equipment, you want a machine that will clean effectively. All the electric models we’ve reviewed have performed well in various tests, so take a few minutes to browse our reviews and buying guide. We’ll tell you what to look for so you get the best bang for your buck. 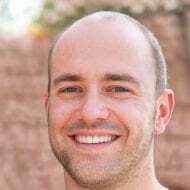 Besides those criteria, we’ll mention noise levels, which surfaces benefit most from each model, and feedback from real customer experiences. Top models include brands such as Sun Joe, Greenworks, AR Blue Clean, Karcher & Ivation. Sleek, compact design with impressive cleaning performance in a very affordable electric washer. Perfect for light to medium-duty cleaning jobs. This affordable pressure washer is great for light-duty cleaning tasks such as vinyl siding and car washing. Stores nicely. The most powerful machine from this brand with long hose and adjustable detergent dispenser. Good for medium and some heavy duty jobs. 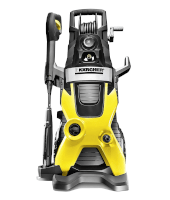 Strongest machine from Karcher’s K Series with patented pump and water-cooled motor. Good for light, medium and some heavy-duty cleaning. This affordable machine has lots of onboard storage with plenty of nozzles and an extra wand. Good for light to medium-duty jobs. 2-year warranty, 35 ft. power cord, 2030 PSI, quiet, 5 nozzles, dual detergent tanks, trigger lock, automatic trigger shutoff. 25-foot hose, 35-foot power cord, can be used vertically or horizontally, hose reel, foldable handles, quiet, dual detergent tanks, simple setup. 30-foot hose, 35-foot power cord, 2000 PSI, “bumper-to-bumper” warranty, adjustable detergent dispenser, great customer service. 2000 PSI, water-cooled induction motor, very quiet, 2-year warranty, 25-foot hose, 35-foot cord, two variable pressure wands included. 2200 PSI, 5 nozzles & bonus turbo wand (w/ onboard storage), self-suctioning (from stationary water source), quick & easy brass nozzle connectors. Short hose (20 ft), difficult to assemble, not great for set-in stains, fittings can strip easily, wand uncomfortable to hold. 1-year limited warranty, can tip over on uneven surfaces, cable storage lacking, cable can be scraped easily, soap runs out too quickly. 1-year warranty, tendency to tip, flimsy hose reel, hose tends to kink, soap nozzle pressure is low, unstable nozzle storage. Tendency to tip over face-first, plastic construction & O-rings not very durable, proprietary parts hard to find, poorly written manual. Short hose (20-foot), 1-year warranty, louder than some models, handle/wand tends to leak, hoses & cord can tangle, easy to roll over hose. This bestselling model from Sun Joe is an impressively powerful pressure washer for no heavier than it is. The SPX3000 weighs 31 pounds, with a high max PSI of 2030, a 14.5 Amp 1,500 Watt motor, 1.76 GPM flow rate, 20 ft. hose, and 35 ft. power cord with manual wrap. It’s good at tackling average cleaning tasks such as cars, driveways, gutters, sidewalks and decks and comes with a 2-year warranty. Five nozzles are included (0, 15, 25, 40 & soap) plus two detergent containers. A trigger lock provides a measure of protection when the wand is not in use. For such a powerful machine, it’s surprisingly quiet at around 81 dB. The dual detergent tanks let you easily switch between cleaning agents if you need to vary the concentration needed for certain jobs. Comes with a 2-year warranty as opposed to 1-year like others on our list. Assembling the pressure washer is a bit tedious. Despite the high max PSI, it isn’t as quick at removing dirt and debris as some other models. The pressure gun isn’t super comfortable to hold, and the hose length isn’t very generous, so you may want to purchase a wand extension and/or a hose extension to reach high areas. Most customers who had light to average dirty jobs were satisfied with the performance. They liked that it shuts down completely when letting go of the trigger. For some with deeply stained surfaces, it didn’t perform as well. The aluminum hose connector threads became stripped for some customers after a few uses. Several reported that they didn’t like that the fittings aren’t universal to make replacements easier. The Greenworks 1950 is a sleek and slim design with a 13 Amp induction motor that delivers up to 1950 PSI at 1.2 GPM. 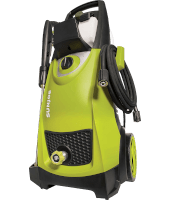 With a 25 foot hose, 35 foot power cord, and 4 nozzles (0, 25, 40 & soap), this little guy is tough enough to do most light to medium duty cleaning jobs such as vinyl siding, cars, etc. It weighs 46 pounds and includes a 1-year limited warranty. This cleaner can be used either vertically or horizontally for more versatility. It has some great storage options, including fold-down handles and a cord reel. Dual soap tanks allow for easy switching between cleaning solutions. The motor is very quiet. The 25-foot hose & 35-foot cord are pretty generous lengths for most jobs. It comes out of the box mostly assembled so setting it up for the first time is simple. A 1-year limited warranty isn’t on par with other cleaners from different brands. There may be quality control issues, but these are usually found right out of the box or within a few uses. Cable storage is lacking – just a velcro wraparound strap to hold it. The power cord comes out the bottom and can easily be scraped unless you secure it. When standing vertical, there’s a tendency to tip over on uneven ground. Lots of customers noted how quiet this machine is. Most love it for light duty cleaning, but say it’s not powerful enough for heavy-duty jobs. They love the folding handles for compact storage. The suction in the detergent tanks may be too powerful, as some customers said the soap was used up too quickly. Some customers thought it needed a better holder for the wand when not in use. The AR390SS is the most powerful electric pressure washer from the AR Blue Clean brand. It has a max 2000 PSI at 1.4 GPM, a 30-foot hose, 35-foot power cord, and weighs 31 pounds. Powered by a 14 Amp, 1.6 HP universal motor, this cleaner includes 4 nozzles (0, 25, soap and rotary/turbo) and is good for most light to moderate cleaning. It has a 1-year “bumper-to-bumper” warranty. This is a really quiet machine for its size and output. The 30-foot hose is generous and allows for a greater reach than most machines. The included rotating nozzle works pretty well for accumulated dirt/grime. It comes mostly assembled, so setup is quick and easy. One nice feature is an adjustable detergent dispenser to control the flow of soap so it’s not used too quickly. Onboard storage for nozzles is a bit unstable, so nozzles may fall off as you’re rolling it. The 1-year warranty is short but it does cover everything included in the box. The hose reel is a bit too flimsy for such a stiff hose. There’s a tipping tendency, plus the hose tends to kink. Pressure with the soap nozzle is fairly low compared to other machines. Several customers were happy with how quiet this one is, especially from a distance. Many commented on how easy the nozzles are to change. Customer service has been attentive and excellent with most issues. By far, the biggest complaint was the weak cord reel, which can bend and break easily. The hose is also a sore point, with many saying it kinks too often and won’t lay flat. The K5 Premium is the most powerful pressure washer in Karcher’s K-Series lineup. 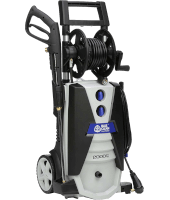 Featuring a 25-foot hose, 35-foot power cord, and water-cooled induction motor, it can tackle light, medium and some heavy-duty cleaning tasks with 2000 PSI at 1.4 GPM. It comes with two wands, weighs 32 pounds and comes with a 2-year limited warranty featuring a rapid exchange program for free, quick replacement of the whole machine. The water-cooled induction motor makes this machine super quiet and prolongs the life of the motor by 5X. It has a patented N-Cor pump that protects the washer from corrosion and wear, prevents leaks, and guards against freezing temps. Instead of nozzles to keep up with, there are two wands – dirt blaster and vario (adjustable pressure). It’s lightweight and simple to set up right out of the box. The vertical design makes it want to fall face down. Plastic components and O-rings aren’t as durable as they could be. Once manufactured in France, they are now made in China. The instruction manual print is pretty small, plus the diagrams aren’t clear enough to be useful. Proprietary parts mean you can only buy Karcher parts for repairs. Calling customer service can be a bit of a cat and mouse game. Customers were happy with performance on light to medium duty jobs such as patio furniture, cars, vinyl siding, and decks. It did well on moss buildup so long as it wasn’t deeply stained. One problem mentioned several times was that the soap didn’t dispense well (or at all) from the dispenser. For some customers, the tendency to tip over damaged the quick connect for the hose. Some thought the pressure wasn’t strong enough. 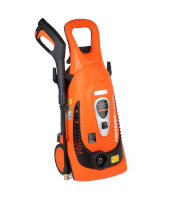 Powerful and lightweight at only 25 pounds, this pressure washer produces 2200 PSI at 1.8 GPM with a 14.5 Amp, 1,600 Watt motor. 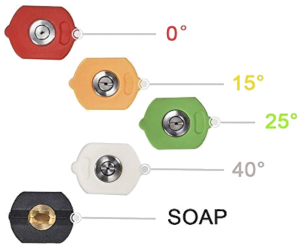 Included are 5 nozzles (0, 5, 25, 40, & soap) and bonus turbo wand with high pressure and wide stream. Great for most light & medium-duty cleaning, it has a 20-foot hose and 35-foot power cord and comes with a 1-year warranty. Onboard storage for wands and nozzles helps keep all accessories in one place. A Total Stop System (TSS) shuts the machine off automatically when you release the trigger. Brass nozzle connectors are sturdy and easy to use. One of the most unique features is a self-suctioning feature which can pump water from a stationary source such as a bucket or tank. Setup is simple, and the instruction manual is easy to follow. The 20-foot power cord isn’t as generous as some other brands. The handle and wand are a bit flimsy, so are prone to leaks and breakage after a few uses. Location of the hose makes it easy to roll over it when moving the machine. The hoses and power cords can get tangled around each other. In hot conditions, the motor is more prone to overheating. It’s also not the quietest pressure washer you’ll find. Customers who have well water reported good performance, even on long- neglected decks. They love the automatic shutoff. It worked well on various surfaces such as cement, stucco, and wooden decks. The most common complaint involved the handle/wand. Several people reported that it busted or sprung a leak after a few uses or just after the warranty expired. It’s also louder than some customers would have liked. Ah the joys of owning your own pressure washer. For most homeowners, electric models like the ones we listed here are plenty powerful enough for your average cleaning tasks. If you need something that will tackle really heavy-duty tasks like paint stripping, deep stain removal, etc. you should probably consider a gas pressure washer. We have a few suggestions for those too. Safety is a big concern with any pressure washer. Some people don’t understand that pressure washers can be dangerous. The very high pressure produced from the water stream can seriously injure people and some surfaces like car paint or glass. We’re talking skin lacerations, even amputations, plus kickback forces that can easily knock a person off a ladder. 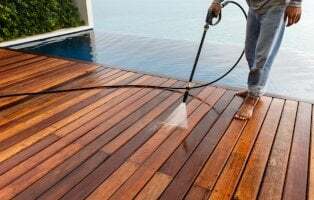 Pressure washers are a godsend for exterior cleaning, but you have to respect them. 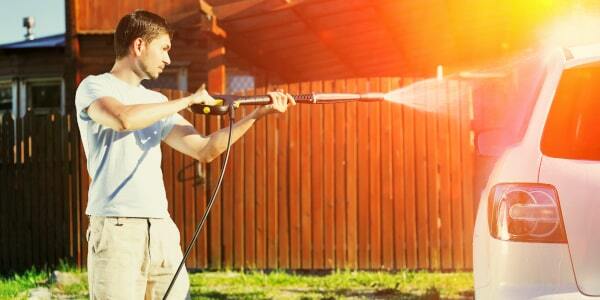 To stay safe, be sure to check out our beginner’s guide to using pressure washers safely. Read and follow the manual! Most pressure washers come with interchangeable nozzles that allow varying widths of water streams. Spinning bar that delivers water stream over a big surface area. Good for large areas like a driveway. Sometimes called a turbo nozzle, sometimes included as a bonus nozzle in the box. Produces a spinning narrow water spray. Good for stubborn stains and grime buildup. Like the surface cleaner, splits single jet into two or three for cleaning large areas. Good for car or boat washing. Helps you reach high areas so you don’t need a ladder. For cleaners with shorter (20 ft or less) hoses, you may want a hose extension. Though this could lessen the pressure somewhat, it’s better than putting yourself in a dangerous position to reach an area for cleaning. During our research, we came across customer and manufacturer suggestions for fixing various issues that may arise with a pressure washer. With electric models, the most common complaints involve the motor not starting and pressure loss. If you’re not confident with your fix-it skills, take your machine to a local repairman or call the manufacturer to see about a replacement. But for those fix-it folks among you, try these tricks. Check the reset button on the plug. It’s possible to trip it while plugging it into the power outlet outside. Try a pump protector lubricant after each use, like this one from Briggs & Stratton. Leftover water in the unit can seize up the pump’s internal gaskets. You screw the plastic threads on the lubricant bottle into the threaded garden hose inlet on the pressure washer and squeeze the trigger on the bottle. It’s especially good for use before extended storage (winter, for instance) and before first startup the next season. There could be an electrical issue within the GFCI plug of the power washer itself, especially if it’s left out in the rain or where there’s lots of humidity. With the unit unplugged, use a screwdriver to take the cover off of the cleaner’s GFCI plug. If you see lots of moisture trapped in the plug, that can prevent it from running. You can buy a replacement plug at the hardware store or one like this Leviton brand online. Just reconnect the wires to the new GFCI plug (black wire to gold connector, white to silver) and turn the screws to secure the wires. Screw down the “U” shaped stress clamps that come with the new plug. Then attach the new cover, and try starting up the machine. The nozzle may have a blockage. Turn the pressure washer off, and bleed air out of the system. Remove the nozzle. Hold the nozzle by the sides with the front of the nozzle facing you. Using the spray tip cleaning tool or a straightened paper clip, try pushing the clog back the way it came. Rinse the nozzle thoroughly front and back. Replace the nozzle and try washing with it again. If the nozzle remains clogged, remove it and repeat the process. If still clogged, try soaking the nozzle in hot water and then try washing again. Try a different nozzle – you might not be using the right one. Look to see if the hoses are kinked and straighten them out. Check the inlet and un-loader valves. If clogged, clean them or replace with new valves. For pulsating pressure, turn off the machine and try bleeding air from the hose by squeezing the trigger. Still having trouble? Try looking up troubleshooting videos like this one about troubleshooting a Karcher pressure washer. If all else fails, call the manufacturer if your warranty is still in effect to see if they can help. If your warranty has expired, you’ll probably just have to purchase a new one.